The Best Selling Single Of All Time Is? That’s a pretty bold proclamation but if you’d like to argue with Mr. Berlin, you might want to take a look at the sales records first. 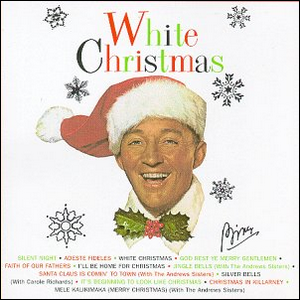 “White Christmas” has sold over 50 million singles of the Bing Crosby rendition and, if you factor in other artists covering the song, it has sold over 100 million singles worldwide since it was first released in 1942. By comparison, the next most popular single is Elton John’s double A-side charity single “Candle in the Wind 1997″/”Something About the Way You Look Tonight” 1997 tribute to Princess Diana with 33 million sales. There’s clearly something magical about Christmas songs when it comes to sweeping the singles charts—looking through the top 25 singles of all time yields five Christmas songs: the aforementioned “White Christmas” as well as Bing Crosby’s “Silent Night” (30 million sales), Mariah Carey’s “All I Want for Christmas Is You” (16 million sales), Gene Autry’s “Rudolph the Red-Nosed Reindeer” (12.5 million sales), and Band Aid’s “Do They Know It’s Christmas?” (11.7 million sales). Image courtesy of MCA Records.